than competitive products over years of 24/7 operation. Combines 1-Chip DLP™ imaging with proprietary SOLID SHINE laser technology for immersive picture quality at 10,000 lm of brightness*1. Dynamic Light Control for 10,000:1 contrast*2. 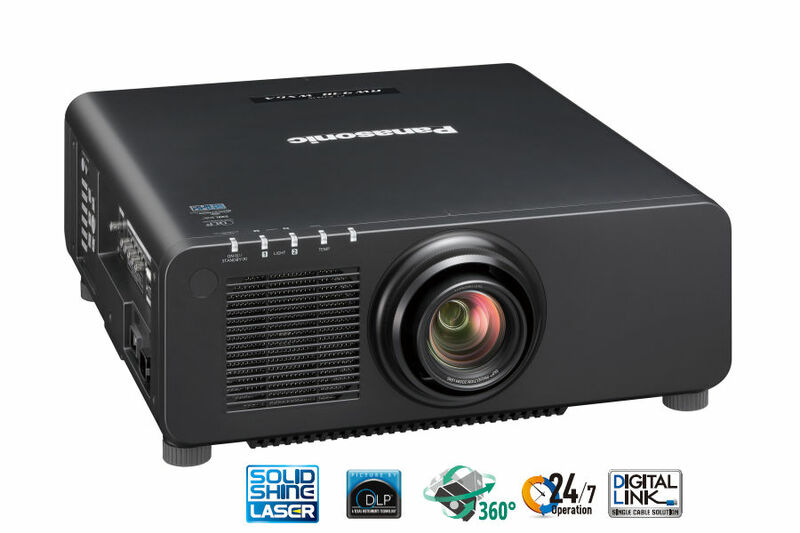 Accurate white balance and color reproduction in any projection mode. Detail Clarity Processor 3 clarifies the finest details. System Daylight View 2 ensures sharp and vivid images in bright environments. Dust-resistant structure with airtight optical block. Dual-drive laser optical engine ensures reliable 24//7 operation with light source failover protection. Up to 20,000 hours of continuous maintenance-free operation*3. Selectable operational modes extend service life to up to 10 years*4. Efficient cooling system for stable operation in ambient temperatures of up to 45 °C (113 °F)*5. 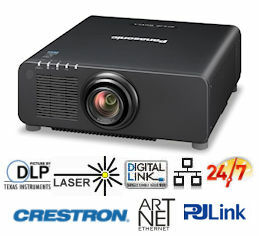 Shares optional lenses with Panasonic 1-Chip DLP™ projector family. Compact body and free 360-degree installation (vertical and horizontal). DIGITAL LINK supports transmission of uncompressed full HD video and control commands through a single CAT 5e or higher STP cable for distance up to 150 m (492 ft)*6. Geometric Adjustment for specially shaped screens. Geometry Manager Pro*7 and optional upgrade kit (ET-UK20)*7. Auto Screen Adjustment Upgrade Kit (ET-CUK10)*8. The PT RX110 directly modulates laser power output to achieve high contrast with low power consumption. Digitally controlled frame-by-frame scene-linking modulation ensures highly precise output adjustment, while accurate 10,000:1 contrast is delivered even when bright and dark scenes frequently interchange. Panasonic’s premium System Daylight View 3 prevents images from washing out in well-lit environments and enhances brightness perception in multi-projector mapping applications by adjusting sharpness and gamma curves and correcting colors. The result is greater visual impact even in challenging conditions. This unique Panasonic circuit optimizes the sharpness of each image based on the super high, high, medium, and low frequency components of the extracted image information. The resulting images are expressed with natural, convincing realism. The Quartet Color Harmonizer wheel mechanism captures a wider color space than comparable projectors, which allows white to be reproduced realistically on screen. Some conventional projectors can’t achieve an accurate white balance, so images can appear with a distracting greenish tint. Not the case with the Panasonic PTRX110 Series SOLID SHINE Laser projectors. Thanks to the long-lasting dual solid-state laser modules, there are no lamps to replace, and image color/brightness degrades very gradually in consistent, linear fashion. As well as reducing maintenance hassle, out-of-the-box picture quality is preserved longer. PT-RX110BE optical block is airtight, ensuring consistent, long-lasting image quality for up to 20,000 hours* without maintenance. The optical block design passed stringent testing to assure utmost reliability in environments with up to 0.15 mg of particulate matter per cubic meter (based on American Society of Heating, Refrigerating, and Air-Conditioning Engineers [ASHRAE] and Japanese Building Maintenance Association guidelines). The structure prevents brightness degradation from dust intrusion. The PT RX110 is among the world’s first to feature Contrast Sync and Shutter Sync functions (Patent Pending) for multi-screen and mapping applications. Contrast Sync allows the projectors’ digitally modulated contrast function to be synchronized over the network for consistent picture quality across screens, while Shutter Sync incorporates a master/slave principle to synchronize shutter on/off timing between all networked projectors. It includes simultaneous fade-in and fade-out functions. Note: Use of straight cable is necessary for all serial connections. Consult your sales representative for further information. Image luminance of all projectors is averaged for unified Dynamic Contrast, rather than each unit setting Dynamic Contrast separately. Step noise is eliminated in edge-blended areas. If shutter functions are not linked, shutter ON/OFF timing varies. When shutter functions of slave projectors are linked to a master, shutter ON/OFF timing is uniform*. Optimally adjusts multiple screens with edge blending, color matching, and digital image enlargement. Edges of adjacent screens can be blended and their luminance controlled. 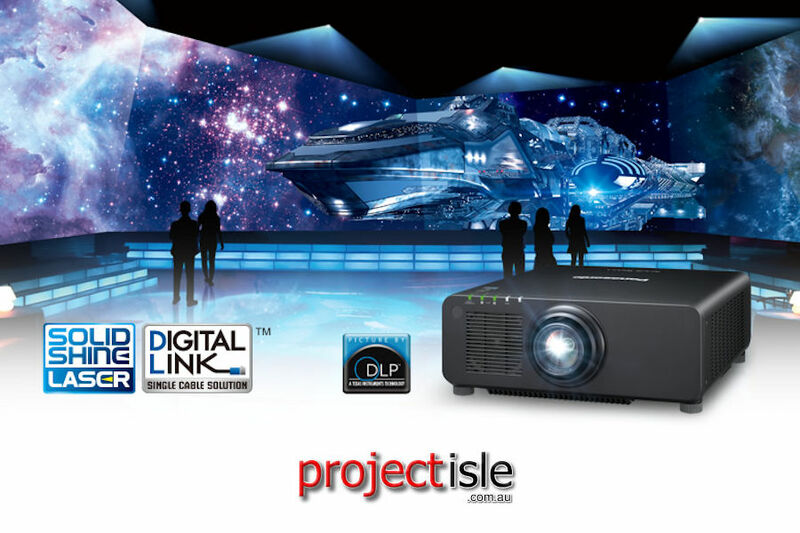 Corrects for slight variations in the color reproduction range of individual projectors. PC software assures easy, accurate control. This function automatically corrects brightness and color fluctuations that occur over time in individual projectors in a multi-screen system. Control up to eight projectors connected via hub increasing to a maximum of 2,048 projectors with Multi Monitoring & Control Software. Upward HDBaseT™-compatible DIGITAL LINK supports transmission of uncompressed Full HD video and control commands through a single CAT 5e or higher STP cable for distances of up to 150 m (492 ft)*. Add an optional DIGITAL LINK Switcher or Digital Interface Box to further simplify installation in large venues while reducing cost and improving reliability at the same time. PT-RX110 is compatible with Art-Net DMX protocol for lighting management. This allows the projector to be connected to a lighting console, opening the door to a range of added functionality and control options. 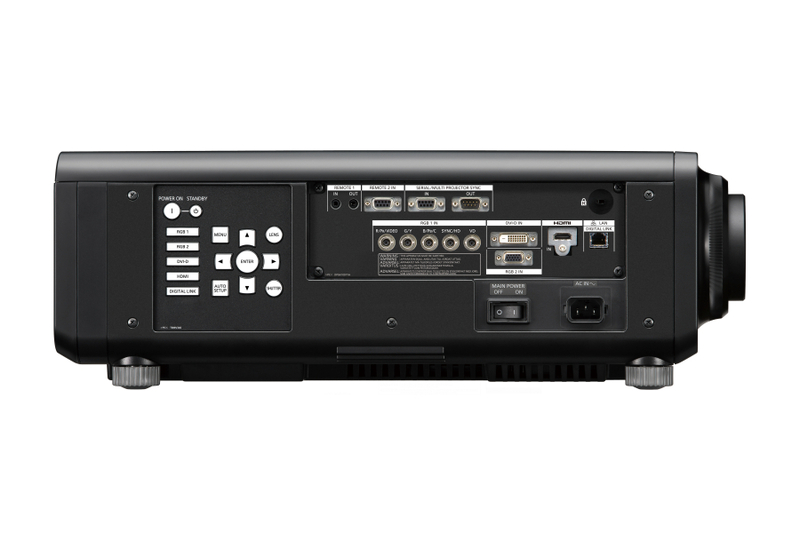 The included LAN/DIGITAL LINK terminal also supports Crestron Connected™ and PJLink™ (Class 1) for seamless integration of PT-RX110 projectors into an existing AV network utilizing multiple device brands. Projection is possible in any direction vertically and horizontally, and the unit can be rotated 360 degrees for installation at any angle. 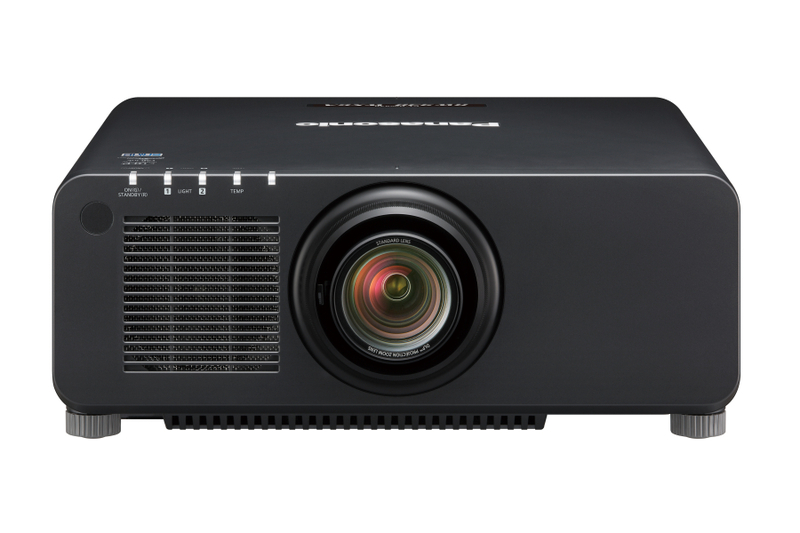 The PTRX110 Series shares optional lenses with Panasonic 1-Chip DLP™ projector range, including the ET-DLE030 Ultra-Short-Throw Lens and ET-DLE085 Zoom Lens for long throw distances, reducing TCO for staging and event companies with large projector inventories. Lenses attach and detach with one-touch ease. Lamps can blow, if you need your projector working and can't afford down time, you may need to keep a spare lamp. The replacement projector lamp for the Panasonic PT-RX110be is the No Replacement.